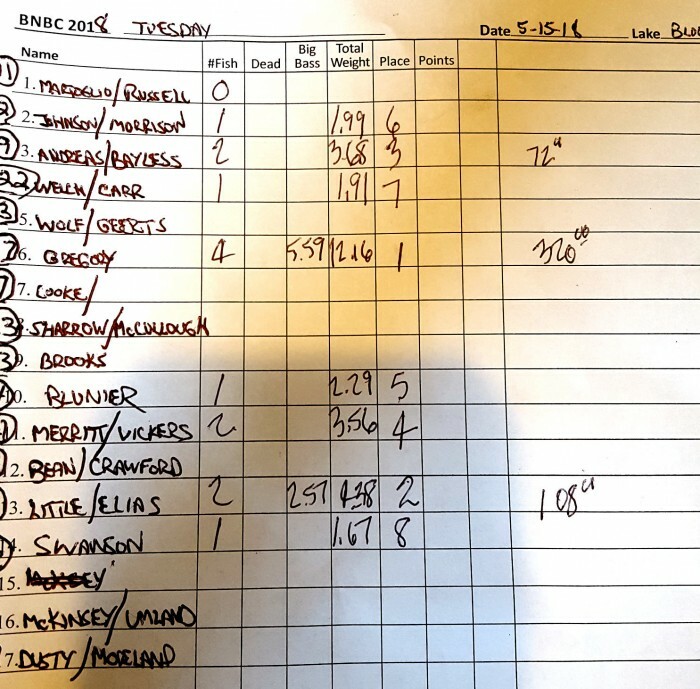 The BNBC Tuesday Night Tournament series continued on Dawson Lake 5-22-18. All 13 teams found fishing good to excellent! A total of 8 teams had their limits of bass. Great time and good to see fishing much better! Still time for teams to make the classic, so get your partner and join the fun! Don’t forget to plan for the BNBC charity tourney on Saturday 5-26-18 On Lake Bloomington, to support a great cause! Unlimited hp and waving lake license requirements for the event. The BNBC Tuesday Night tournament series held a tournament on Lake Bloomington last night, and 15 teams came out to chase the bass on the lake. Conditions were more favorable than they have been with water temps much higher and air temps much more tolerable as well. The bass were still difficult for some of the field, however: someone always figures them out and last night was no exception. The team of Gregory and Gregory lapped the field with their catch! Fishing is improving so come on out and join the fun! 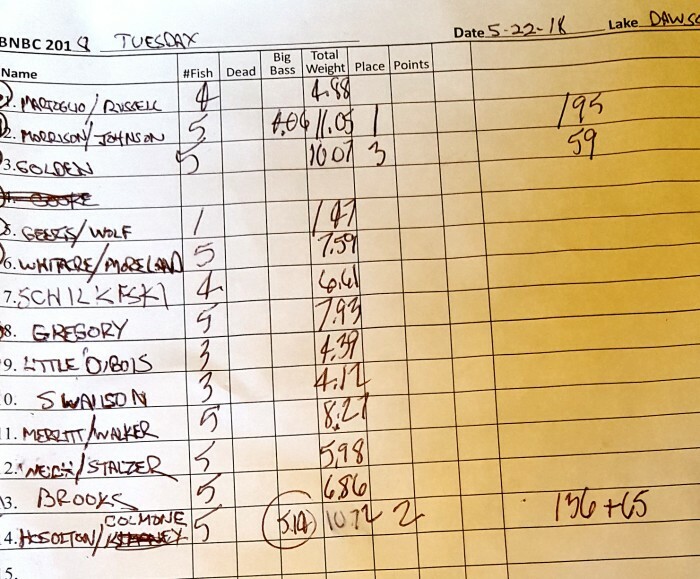 The BNBC Coffeen Lake tournament on 5-12-18 near Hillsboro. Conditions were great and fishing was outstanding! All teams weighed limits and caught large numbers of bass. Patterson varied, buzz baits, horny toads, jigs, plastics, great time! The BNBC Tuesday Night Tournament series traveled to Dawson Lake today on a finally warm and favorable weather day. 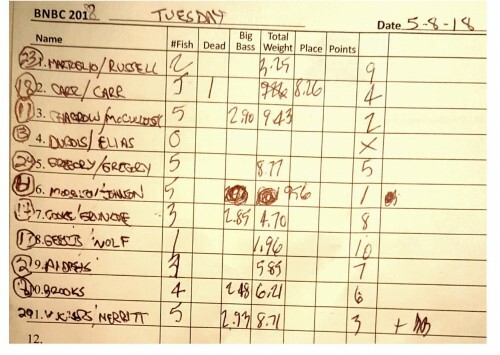 The weigh in validated it as well, as we had the best weigh in of the year with 11 teams competing for the win. 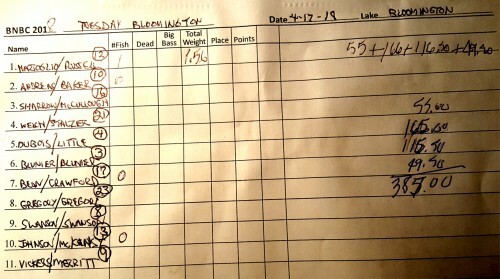 Best weigh in result for the year so far and almost all teams had good results with catching several fish, many small however. Well next week we will be at Lake Bloomington, and likely more of the same kind of success with much improved weather so come out and join the fun! Until then good fishing! The BNBC 2018 Tuesday Night Tourney schedule opened on 4-10-18 to a very chilly outside temps and low water temps as well. Turnout was a little lower than normal for Dawson Lake, but as usual someone figures them out, and last night was no exception. 6 teams braved the chilly conditions in pursuit of team of the year. Next tournament is on Lake Bloomington on 4-17-18, take off at 5:30pm, hope to have better conditions, see you there! The BNBC 2018 tourney opener was held on Spring Lake on 3-31-18, to kick off the 2018 schedule. This year tourneys are being scheduled on Saturdays to aid in tournament approvals with the targeted lakes, and to reduce conflicts with Sundaycluttered tournament schedules. Seven hardy and optimistic teams showed up for the 1st tournament of the year on a windy, chilly, and threat of rain day. Take off was dry and wind wasn’t too heavy for start of the tournament, temps in the upper 30′s. Water temps at take off ranged around the low 40′s to the mid 40s, and was basically pretty clear. Fishing was slow for all the teams, but as is usually the case someone always figures it out, and this tournament was no exception. 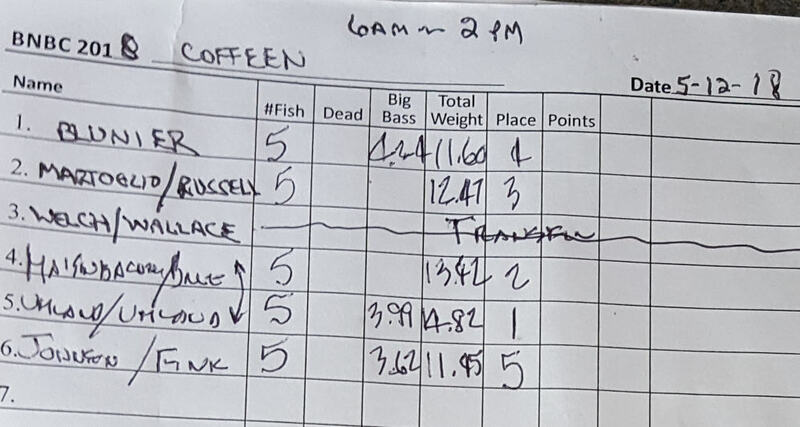 The team of Martoglio and Russell brought in a nice bag of 4 fish to win the event, and the team of the Umland brothers was 2nd. This puts the team of Martoglio/Russell in 1s place for team of the year with the next tournament on Sangcris on 4-21-18 sign up at the meeting on 4-4-18 at Sam Lemans upstairs in the training room. Speaker at the meeting is from St. Jude’s Children’s hospital, so come out and sign up and get some great information on this wonderful charity. It is also a great time to get the 2018 membership taken care of prior to the tourney on 4-21-18. Happy Easter to everyone and hope to see you at next meeting or next tournament, hope you’re catching them!